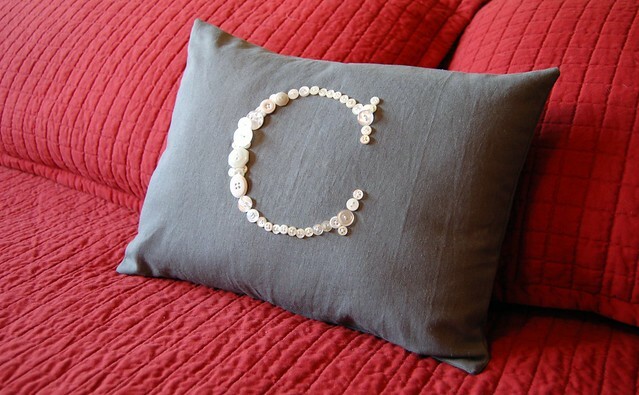 I made this button monogram pillow yesterday while watching college football. (Football and crafts just go together, you know.) If you’d like to make one too, visit Kari at The Adventures of One Crazy Lady for her tutorial! I’m tempted to spell out “H-O-M-E” across four square pillows for my couch! This is a great way to use our buttons! I will try to do something like this to add a delicate touch to my bedroom, and why not my sons’ bedroom! I am super slow in finding this, but that you so much for linking back up to my blog! Your pillow is beautiful!